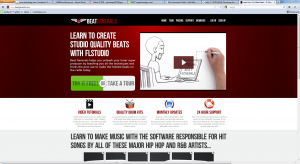 When Beat Generals came to us, they had a site 90% completed using a C# backend. The client expressed that every time they had their current development group make a change, three other things would break. We conducted a code review and found the code was very unstable. We suggested a rebuild using PHP as the backend (based on a long discussion). Beat Generals asked us to go ahead and do the rebuild for them. We converted the code from C# to PHP and built a custom e-commerce platform as well.